March 28, 2019 Panuruj Luevisadpaibul, M.D. Congenital heart defects are one of the most common conditions among infants under the age of one. One of the causes of such a condition is a diabetic mother, or a mother contracting an infection, such as rubella, during pregnancy. Pre-conception screening is of huge important because it provides an assessment for the health of both mother and father. Also, where any issues are identified, the doctor will be able to provide immediate treatment, thereby ensuring that a child has the best chance of being born safe and healthy thereafter. Congenital heart defects are one of the leading causes of death in newborns and infants under the age of one, across the globe. Issues related to congenital heart defects account for 1 in 3 disabilities affecting other bodily organs. Some infants can be diagnosed as suffering from cardiovascular irregularities prior to birth or immediately after they have been born, while others experience heart problems that do not become apparent until they are older, or when it the condition becomes too severe to be treatable with medication. Studies have found that congenital heart defects are usually a result of the mother contracting an infection during pregnancy, with rubella being particularly dangerous in this regard. In some instances, medication taken during the first 6-12 weeks of a pregnancy are also be blamed. However, the true causes of congenital heart defects are not yet fully understood. In 50% of such cases, medication and care according to the specific symptoms are sufficient to treat the condition, in the remaining 50% surgery is required for treatment. The heart is the first organ that develops, beginning during the 4th week of a pregnancy and growing rapidly for the next 2 weeks. 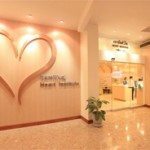 It is during these 6 weeks that parents may be able to watch their child’s beating heart in amazement when undergoing an ultrasound examination. However, this first 6-week period is also the time when the fetus is most vulnerable to contracting infections, such as rubella. Hence, parents must ensure that they provide the utmost care for their child’s heart at this stage by eating healthily, maintaining personal hygiene, and avoiding cigarette smoking and certain forms of medication that could potentially damage the heart of the unborn child. Those in the medical profession will begin referring to the fetus as an unborn child once a pregnancy has passed the 10-week mark, at which point the infant’s heart will start to take its final form. At this time, in addition to being able to see the infant’s body taking shape, the sound of the child’s heart can be heard using a Doppler sound wave stethoscope. A normal heart will beat at around 160 beats per minute at this stage which, when compared to the heartbeat of a fully grown adult, may seem rather fast. However, from the 12th week of a pregnancy until the 28th-38th week, the child’s heart beat will gradually slow down until its development is complete. of infants in the womb include diabetic mothers or the mother contracting a virus, such as rubella, while pregnant. Chromosomal abnormalities in the mother which result in arrhythmia for the unborn child can lead to an edema, developmental issues, and congenital heart defects. Having a family history of the condition also increases the risks. An ultrasound assessment of the unborn infant’s heart cannot provide a comprehensive answer as to whether the infant has a cardiovascular abnormality because some cases only become apparent after birth, or once the child has grown to a certain level. Pre-conception screening of both mother and father. Where any health problems or congenital conditions are identified, a doctor’s appointment should be made to receive consultation about medication which could have an effect on the pregnancy, as well as to receive advice on vitamin supplements that should be taken prior to conception. For instance, doctors will often prescribe folic acid to be taken during the period of 2-3 months prior to conception. Register your pregnancy with a medical facility and strictly adhere to your doctor’s advice, making sure to keep up with the appointments in order to monitor the pregnancy’s development. Manage your weight, ensuring that any weight gain is gradual and that excess weight is avoided as these can result in the unborn child developing diabetes. Avoid smoking and drinking alcohol which means also staying away from areas that contain cigarette smoke due to these factors having an adverse effect on the development of bodily organs. Exercise regularly after consulting with your doctor or midwife. Practice mental wellbeing to avoid anxiety and stress. Eat a healthy, balanced diet consisting of the 5 main food groups in moderation, drink plenty of water and avoid foods that are high in fat and overly flavorful. If you experience any irregularities, for example, high blood pressure or vaginal bleeding, seek medical attention immediately. As previously mentioned, some forms of heart defect only present themselves after birth. In cases where surgery is not required, care and medication are used to regulate the patient’s symptoms. This includes taking care of dental hygiene and ensuring the patient only partakes in light exercise or according to specific medical advice. In addition to this, children with a congenital heart defect should not be made to worry about their condition to the extent to which they become stressed or start a strenuous exercise regime. If a child is found to be turning blue due to a drop in oxygen levels, immediate medical attention should be sought to carry out a diagnosis and to analyze whether treatment in the form of surgery is required, and the use of medication has been futile. As the heart is such a vital role of life, mothers should take special care of their health to ensure they are at full strength for the duration of their pregnancy. This will help to prevent against a childhood heart defect. Both obstetricians and pediatricians also have a key part to play in maintaining the mother’s health. Nevertheless, if a congenital heart defect is identified at birth or beyond, parents need not feel too down or anxious. Instead they should try to develop their understanding of their child’s condition to ascertain whether it can be cured through treatment provided by a specialist pediatrician. Whatever you do, always remember this: “a child’s heart is kept strong by the strong hearts of both parents”. How to Ensure Your Child’s Heart Stays Strong Congenital heart defects are one of the most common conditions among infants under the age of one. One of the causes of such a condition is a diabetic mother, or a mother contracting an infection, such as rubella, during pregnancy.